There is presently a cyclone alert for the Fiji Islands – in particular the Mamanuca and Yasawa group. Resorts in these Fiji island groups are advising guests to move from the island and find alternative accommodation in Denarau until the cyclone passes. This morning the Yasawa and Mamanuca group of islands have been placed on Cyclone alert. 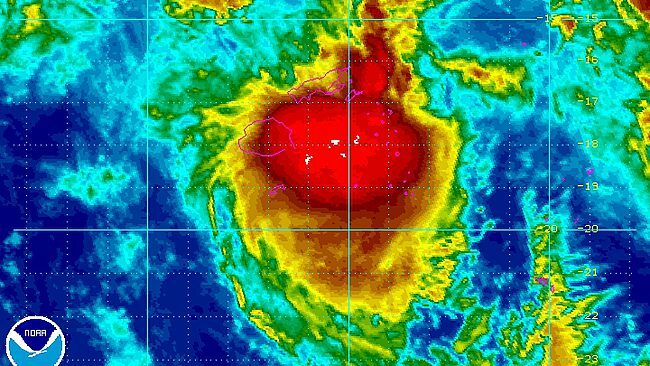 Severe Tropical Cyclone Evan may reach the Fiji Islands Monday 17th December. As a precaution we are currently assisting and urging all guests on island to move to Denarau hotels until the cyclone passes. We are also not accepting any new guests on island until the situation passes. If you are due to travel to Fiji in the next 4 days (Sat 15 Dec to Tue 18 Dec), please keep in contact with your airline/travel agent for further updates on the weather situation. Stay safe Fiji. We are thinking of you. A TROPICAL CYCLONE ALERT REMAINS IN FORCE FOR VANUA LEVU, TAVEUNI AND THE NEARBY SMALLER ISLANDS AND NORTHERN LAU GROUP. A STRONG WIND WARNING REMAINS IN FORCE FOR VANUA LEVU, TAVEUNI AND NEARBY SMALLER ISLANDS AND NORTHERN LAU GROUP. DAMAGING HEAVY SWELL WARNING REMAINS IN FORCE FOR VANUA LEVU, TAVEUNI AND NEARBY SMALLER ISLANDS AND NORTHERN LAU GROUP. ….For more information please refer to the latest Special Weather Bulletin for Fiji on Severe Tropical Cyclone Evan issued from RSMC Nadi. Picture from Castaway Fiji’s Webcam as at 15 December, 2013. In terms of tourism operations, things are completely back to normal after the recent Fiji floods. It’s a wee cloudy today but the weather has been stunning! If you’re planning a trip to Fiji there is no need to worry. In fact, the forever-smiling Fijians would love a visit from you! When things like this happen in Fiji it hits the country hard. Tourism is a major part of livelihood. Your visit to Fiji will help them get back to normal asap.